Using limited energy resources in sustainable ways, energy engineers and technologists have made our lives comfortable and affordable. However, due to an expanding world population, global energy resources are being increasingly strained. Considering this scenario, effective energy management, energy efficiency, and a significant use of renewable energy sources are key strategies for meeting global energy requirements. Energy managers, researchers, scholars, and policy makers need to know all aspects of energy engineering and technology to deal with current energy issues. An invaluable resource for professionals in academia, business, industry, and government, as well as undergraduate and graduate students in different academic disciplines, the Encyclopedia of Energy Engineering and Technology, Second Edition – Four-Volume Set presents a wealth of information on energy efficiency, renewable energy systems and technologies, the financial analysis of energy systems, energy economics, environmental regulations, sustainable development, green building, the use of nanotechnology to develop energy systems, energy storage, fuel cells, and more. Contact Taylor and Francis for more information or to inquire about subscription options and print/online combination packages. "… provides an incredible wealth of information on not only the basic science and engineering arenas, but also the planning, operational, R&D, business, and economic aspects of contemporary energy engineering and energy technology. … While giving the reader compelling scientific evidence as well as timely research to support theories and conceptual frameworks, this work also provides practical knowledge, based on the included case studies and real-world scenarios. … the contributors reference a wealth of literature and provide suggested additional readings to accompany each article. … a must-have for advanced students and scholars in academia who participate in energy-related research studies, as well as professionals in energy fields, including government officials and those whose businesses or industrial operations are affected or dependent on these technologies. Summing Up: Recommended. Upper-level undergraduates and above; professionals/practitioners." "… an informative reference work that will appeal to energy researchers, engineers, policy makers, and graduate and undergraduate students interested in the field. The Encyclopedia can assist students working on an energy research paper or project, provide active researchers with a quick review of a specific topic, process, or technology, and provide policy makers with an overview of the economic implications of various energy solutions. This compendium of information on energy resources explores all aspects of energy engineering and technology from the theoretical to current applications and possible solutions to issues. Contributors to this edition represent many regions of the world and are active in academia, business, industry, and environmental groups. This second edition of the Encyclopedia (four volumes) is forty percent larger than first edition (three volumes, 2007) resulting from the expansion of several sections and the addition of new articles. Mirroring energy research interests in recent years, the section on Renewable Energy has the largest number of new articles and is three times larger than its first edition counterpart. Other sections with significant increases in content are: Energy, Energy Sources and Energy Use, and Principles of Energy Analysis and Systems/Economic Analysis of Energy Systems. The Encyclopedia is arranged alphabetically by article title, and each volume features both alphabetical and topical tables of contents covering all four volumes. The topical table of contents is very helpful as a discovery tool as it brings together related articles from all volumes, allowing the reader to explore the subject in depth. Each volume also contains a detailed index for the entire encyclopedia. Most articles are five to seven pages long, but article length varies. Of the articles reviewed, the shortest was just over four pages, while the longest was twenty-seven pages. The Encyclopedia is illustrated and articles include black-and-white photographs, diagrams, and graphics. Some articles also provide nomenclature charts containing explanations of units and abbreviations or acronyms used by the authors. The energy topics covered in the Encyclopedia range from well-established energy technologies and sources (e.g. coal-to-liquid conversion) to developing technologies (large-scale solar and wind projects) to theoretical energy solutions (e.g. ocean thermal energy conversion). In addition, there are articles that discuss renewable energy education as well as the management, accounting, and auditing practices for the efficient use of energy in buildings and industrial plants. … All the Encyclopedia articles reviewed are objective and provide a good balance between the technical and non-technical information. Most are well written and edited, with very few grammatical or other errors noted. Generally, the content covered will be understood easily by experts, and will be accessible to novices who will be able to develop a high level understanding of a topic. … The structure of individual articles is essentially the same throughout the Encyclopedia: abstract, introduction, overview and/or detailed discussion of the topic, conclusions, and references, helping readers to know what to expect as they move from article to article. The history and development of a topic through time are usually discussed, providing context for the reader. The references can be helpful to readers providing them with additional sources on the topic. 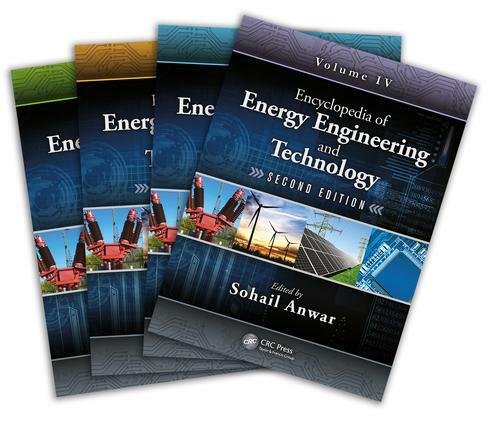 … The Encyclopedia of Energy Engineering and Technology (Encyclopedia) 2nd ed. is recommended for research libraries in academic, industry, business, and government whose users are working on or are interested in research in energy sources as well as their efficient use and management." Power System: Advanced Technology Application; Mujahidul Islam, Manuel Alcazer-Ortega, and Alexander Domijan, Jr.
Dr. Sohail Anwar is an associate professor of engineering at the Altoona College of The Pennsylvania State University. He is also a professional associate of the Management Development Programs and Services at The Pennsylvania State University, University Park. Dr. Anwar is a senior member of the IEEE and a member of ASEE and PAS. He has served as a member of the IEEE Committee on Technology Accreditation Activities (CTAA), as commissioner of the Engineering Technology Accreditation Commission (ETAC) of ABET, and as co-editor, editor, and editor-in-chief of numerous scientific publications.